Check out this brilliant machinima piece, describing the EX.IT project I posted last week. I think the choice of soundtrack is perfect – with the urban sounds of cars honking every so often – with rain in the background, creates a real sense of place and embodiment. This holistic integration of art, architecture, sculpture, cinematography, photography, fashion – clearly exercises a level of restraint and careful consideration that really makes you want to experience this virtual place for yourself. Brilliant work Lucam, keep it up! 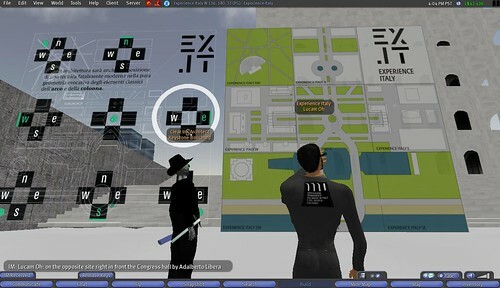 The 9-sim campus is modeled after the 1942 ‘E42’ exhibition area for a Universal exhibit in Rome which was unfortunately stopped by the war. Some of the best Italian architects worked on the project, which includes a Sport palace, Palazzo of the Civilta Italiana, Congress Hall and Congress Center as well as many other builds. This faithful recreation of the design was built by Fondazione Valore Italia for the Permanent Exhibition of ‘Made in Italy’ and ‘Italian Design’. During a recent tour by Lucam Oh , organizer and builder, Lucam said that he hoped the build will become ‘alive’, and hoped the architectural community of Second Life will utilize it as a place to meet, organize meetings, and host exhibitions and architectural research. I find the architectural approach to the project quite inspiring and unique. While many virtual architects see the pure recreation of real life designs a waste of time (in a world free of gravity, why build things that look as if they depend on it? ), this build is one of the unique circumstances where the build cannot be fully experienced in real life – or any other way. This virtual creation enables visitors to experience a place that they would not otherwise be able to visit. Beyond that, EX.IT also takes an interesting albeit modern or honest approach to the actual process of real-life replication by embracing its synthetic nature. Trees aren’t photoreal, but are modern artistic interpretations – and featuring a ‘moire’ effect. 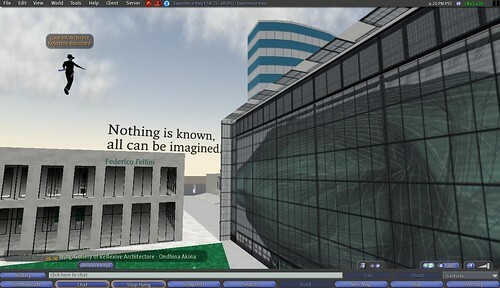 The hovering graphic quotes challenge the notion that this is mere replication, and blurs the distinction between graphic arts and architecture, which I consider to be a defining characteristic in the new language of virtual architecture. This project is clearly of interest both architecturally and historically, but is also compelling from a graphic design perspective as well. The architecture is punctuated by very clear and iconic way finding graphics, as well as large alpha-texture quotes suspended in the sky. The quotes are placed in locations that create interesting juxtapositions and frame the architecture very nicely. Even the map is a graphic design masterpiece IMHO, reflecting the modern flavor of the architecture and exercising a great deal of restraint and simplicity. The graphic design finesse doesn’t stop at the virtual build. A website augments the build, which I imagine will be highly effective in inviting ‘outsiders’ into Second Life. 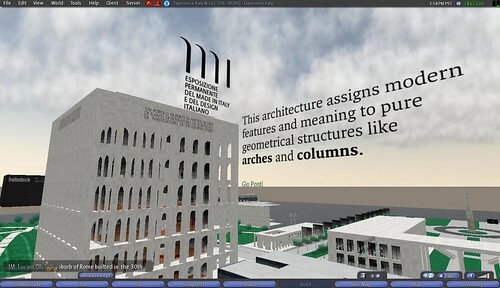 Seen HERE, the website stays true to the graphic language, and the ghosted 3D background image subtly encourages viewers to dive deeper into the experience. Lucam Oh will be presenting the build to the Italian Institute of Architecture on November 26th at 8PM Rome time. The meeting will be open to the public and all are welcome to attend. Visit Experience Italy HERE (SLurl).